Plan Toys new Planimal play sets introduce kids to conservation using fun animal characters from four continents: Antarctica, Australia, South America and Asia. Each Planimal set comes with three or four adorable wooden animals made with eco-friendly, chemical free recycled rubberwood — which is finished with non-toxic, water-based dye. The necks and legs of all Planimals can be adjusted to move up and down so that they sit and stand just like real animals, encouraging pretend and interactive play. 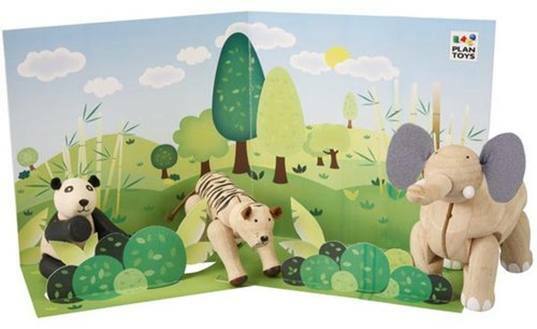 Each set also comes with a distinctive graphic backdrop of the animals’ habitat. Learn more about these fun teaching tools and toys from the wild kingdom after the jump! The Planimal Polar Series includes a Polar Bear, an Arctic Fox, a Penguin, and a Harp Seal who must deal with below freezing temperatures, icy water, and biting winds. Australia has some of the most unusual animals and plants found anywhere on earth, and almost all marsupials are found only in Australia. In keeping with these facts, the Planimal Australia Series features many pouched and unique creatures: Kangaroo, Koala, Wombat and a friendly Emu. Asia has the biggest land mass in the world and an amazing variety of animals. To demonstrate biodiversity, three unique mammals are featured in the Planimal Asia Series including an Elephant, Panda and Tiger, plus a scenic Asia inspired backdrop. The Planimal Africa Series encourages kids to go wild with some of Africa’s most famous mammals: a Giraffe, a Lion and a Gorilla. Plan Toys new Planimal play sets introduce kids to conservation using fun animal characters from four� continents: Antarctica, Australia, South America and Asia. 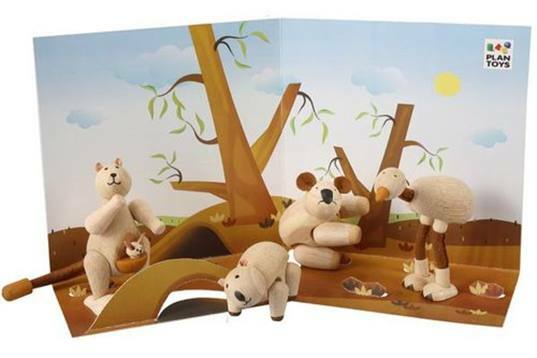 Each Planimal set comes with three or four adorable wooden animals made with eco-friendly, chemical free recycled rubberwood -- which is finished� with non-toxic, water-based dye. The necks and legs of all Planimals can be adjusted to move up and down so that they sit and stand just like real animals, encouraging pretend and interactive play. Each set also comes with a distinctive graphic backdrop of the animals� habitat. Learn more about these fun teaching tools and toys from the wild kingdom after the jump!